Sharon Morin discusses her professional development course at the Glenbow Museum in Calgary, Alberta. I am very fortunate to be the Program Manager at the Musée Héritage Museum. I have been encouraged from our Directors all the way up to the Board level to expand and grow my skills and knowledge in all capacities. My latest opportunity was to go to the Glenbow for a 2 day course on Care of Artifacts in Aboriginal Cultural Centres, offered by the Canadian Conservation Institute (CCI). Now I know to some people this might sound a little dry but our presenters Janet Mason and Elisabeth Joy made these two days interactive, informative and thoughtful with some humor and fun thrown in. Both were personal, organized, seasoned and prepared. They brought all types of objects for us to analyze. Objects like a 1890’s photo album, a little girls pink sock, a pair of Inuit Kimmuks and a Javanese Shadow Puppet to name a few. We were challenged to figure out why the objects were deteriorating, how to store, prevent, stop and sometimes restore if necessary. 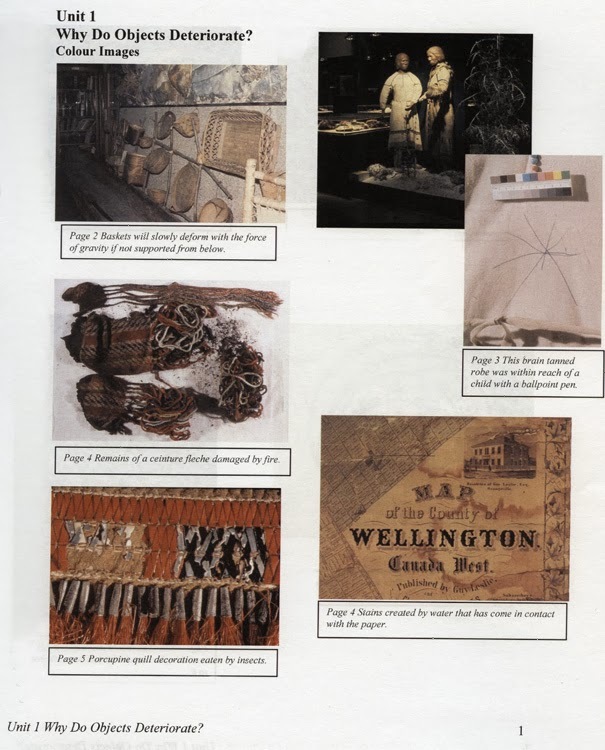 Unit 1, page 1 of the workshop booklet, "Care of Artifacts in Aboriginal Cultural Centres", produced by the CCI. At the Musée my primary focus has been in developing both Educational and Public programs, giving our collection and heritage buildings a voice. This 2 day workshop has expanded my knowledge of the roles that our Curator Joanne and our Collection Assistant Kathleen have at the Musée. I know some of the work that goes into the development of the exhibits, such as the need to have a clear path to our artifacts and some basic knowledge about proper storage. I thought I knew a lot, but I really had no idea of the attention to detail that is given so that future generations can appreciate and have the complete story of the artifacts in our collection.